APPSC Panchayat Secretary Result 2018: Andhra Pradesh Public Service Commission has announced the Mains exam date for the posts of Panchayat Secretary under Group 3 recruitment process. The exam will be conducted on 22nd September and the APPSC Panchayat Secretary Group 3 Mains Results 2018 will be uploaded on the official web page about which we will keep you updated. 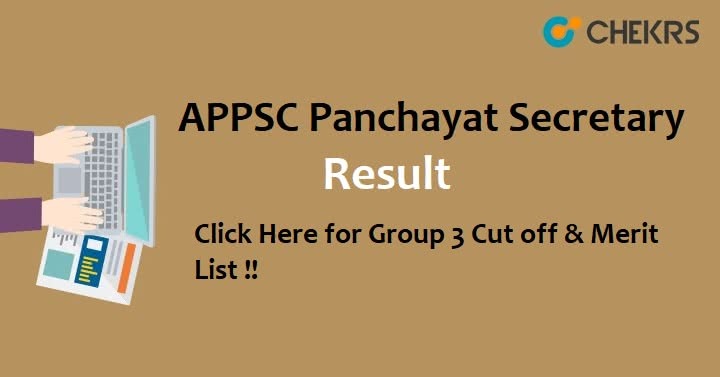 In the subsequent section of the article, we have provided the direct link so that you can check your APPSC Panchayat Secretary Result 2018 right here. To check your AP Group 3 Results, have a look on the below stated guidelines and follow them in the same manner. Visit the official web portal of APPSC. Go to the tab of ‘Results’ available on the home page. Now, select the link for AP Panchayat Secretary Result 2018. Move ahead to the login page and enter the required details there. Proceed forward and get your score cards. The cut off list is released for every competitive examination because it is the basis to select the candidates. Candidates, who get succeed to achieve the minimum qualifying marks i.e. cut off marks, are called qualified and get shortlisted for the further rounds. Similarly, the candidates who will clear the AP Group 3 Mains Cut off will get selected. Previously, the Preliminary exam was conducted for the posts and the selected candidates were shortlisted for the mains examination. The APPSC Group 3 Merit List 2018 will be prepared on the basis of the aggregate marks obtained by the candidates in both exams. The candidates whose name will appear on the merit list will be called for the further recruitment process. The Answer Key will be released a few days after the completion of the exam with the help of which you can make estimation about your selection. Remarks: Candidates can check their APPSC Panchayat Secretary Result 2018 on the commission’s website, once it gets declared. Share your related queries with us in the commenting section.